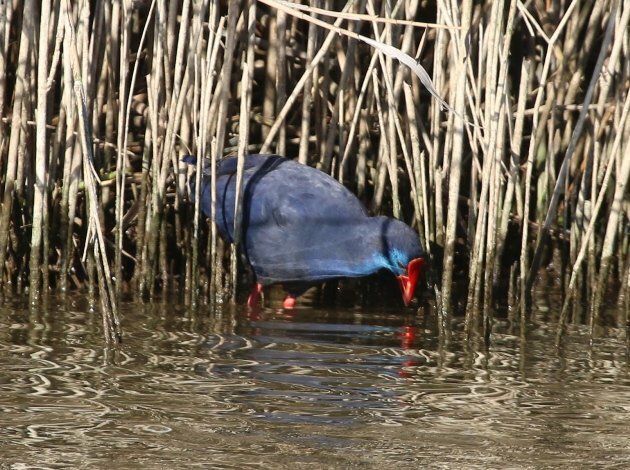 David recently published a post on your favourite bird blog about the taxonomy of the Purple Swamphen, a massive rail found throughout most of the “Old World”. 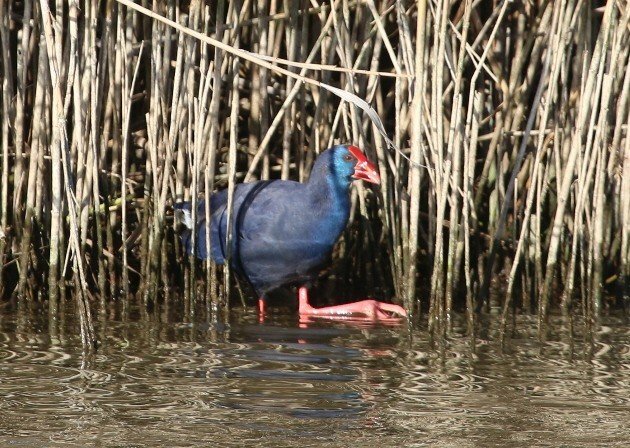 According to an article he summarizes, genetic data suggests that the Purple Swamphen is paraphyletic since it does not include the critically endangered and equally enchanting Takahe. Dang. This leaves us with two options. The first one is to consider the Takahe as no more than a subspecies of the Purple Swamphen. This is ridiculous for two reasons. One – the Takahe is far too cool a species to lose. 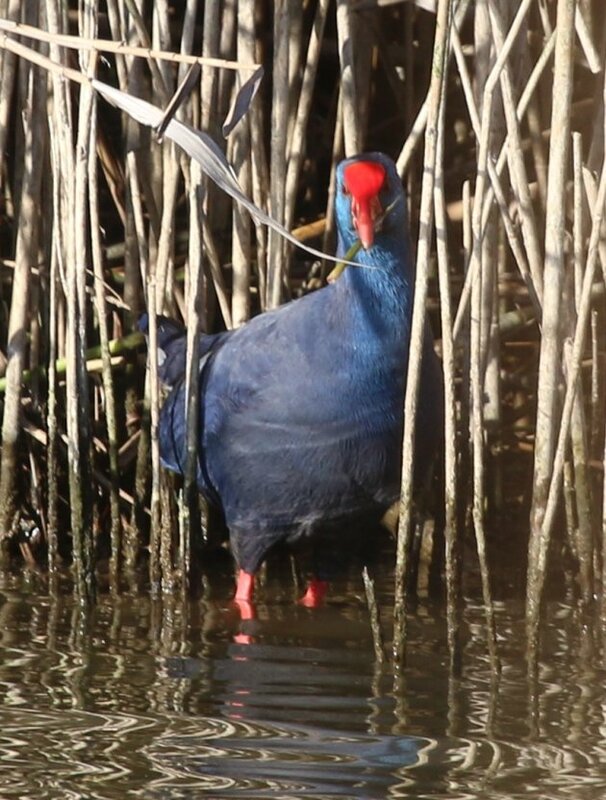 Two – there is so much distinctness amongst the different forms of the Purple Swamphen that lumping means we may as well lump all the world’s reed warblers into one huge species and be done with it. Which seems to make sense, come to think of it … well, nonsense. So, if lumping is out of the question because we love Takahes far too much, then splitting is inevitable because we love monophyletic groups even more. 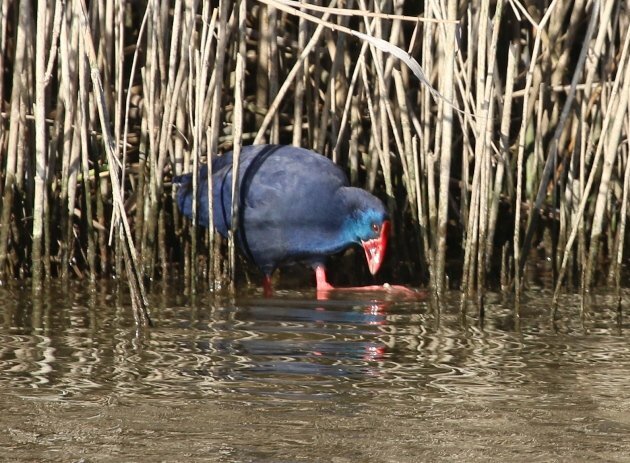 The African Swamphen occurs along the lower Nile and its delta into the Mediterranean, while the Grey-headed Swamphen makes southern Turkey its home. For both forms, their little patches within the WP are but outlying exclaves of a much wider range elsewhere in Africa and Asia, respectively. 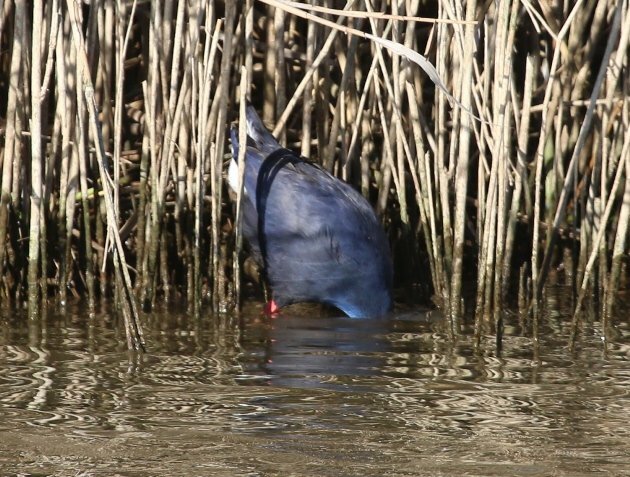 However, the European or Western Swamphen (and boy, do I wish they find a nicer name once the split is accepted) is entirely confined to a small area of the WP, as it currently ranges very patchily from NW Africa and Spain to the Italian island of Sardinia. This may not sound like much, but it is really good compared to just a few decades ago, when hunting had significantly reduced its range and overall population. Way back in 1995, on my first trip to Spain, it was almost an outrageous event to see Purple Swamphens in the far north-east of the country. All the birds we saw were banded, as they had been released in an effort to re-introduce the species to those areas within their former range where hunters had been all too effective. Nowadays, they are a frequent sight in the many wetlands of the western Mediterranean and are doing quite well in most areas, like the reserve S’Albufera on the Spanish island of Mallorca where the pictures of this post were taken just a few weeks ago. They will stand motionless at the edge of a reed bed for hours, not moving a muscle while they wait for their prey. When seen from their prey item’s perspective, the blue colouration provides perfect camouflage against the blue sky. On cloudy days, they go hungry. Once they’ve spotted their prey item, they dash forward into the water, and their massive bill closes mercilessly around their unsuspecting meal. It can be a grim sight. 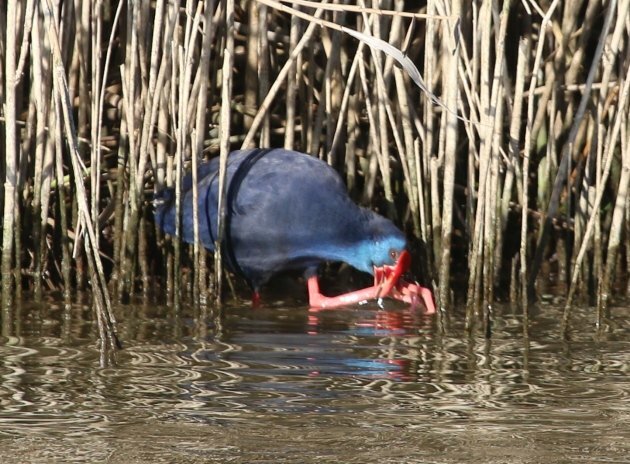 The prey is then grabbed with the Purple Swamphen’s spider-like toes and brought to the surface. If it still shows signs of life or even struggles to free itself, the plant matter is quickly dispatched with another bite of the massive bill. Such are the habits of the Purple Swamphen. Pay heed to the warning. “Caimao”? Now, if GoogleTranslate’s got it right, this is a very fitting name! Thanks! I agree. They are evil. They tried to eradicate them in Florida, but failed so completely that they are now on the ABA checklist. I visited a nature trail in Broward County a couple of weeks ago, near where the swamphens were first sighted in Florida, and the devils have pretty much taken over 50% of the sanctuary. Bad bad swamphens.